Robust and innovative LED display systems direct and inform travelers and sports fans everyday. 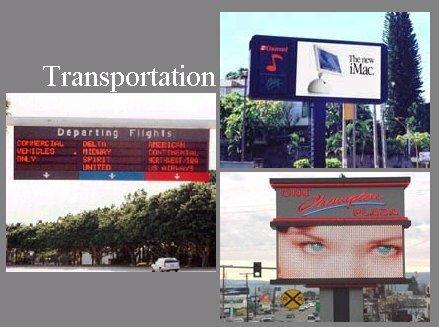 Whether sports scoreboards, led scoreboards, out door message displays or walking through airports, bus or train terminals, and sports areas, travelers count on LED Display systems to help them get where they are going easier and faster. 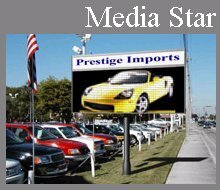 LED signage for many different types of advertising and entertainment.Outdoor displays and indoor displays. LED or video projection systems. One color or 16 million colors. Communicating with travelers is critical for airlines and airports, whose customers need to make proper connections. 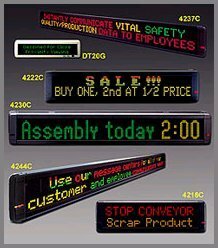 In addition to displays that show flight information, We also manufacturer LED display systems that show baggage claim information, parking information, plus advertising and promotional messages as well. Moving traffic efficiently on freeways requires up-to-date information that can be delivered easily to all motorists. LED Outdoor displays offer the perfect technology for intelligent traffic management. 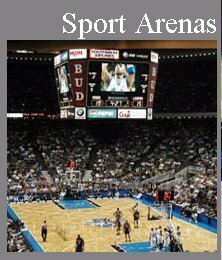 Basketball, baseball, football, soccer, hockey, wrestling, swimming scoreboards. Video on scoreboards is the up and coming requirements in sports arenas. We have LED video displays as well as projection systems. Managing and directing the traffic on a real-time basis is an important factor to alleviating the congestion and patrons' frustrations. We can design and supply an interactive, centrally operated system, using fixed and/or portable locations incorporating cameras and visual information displays within the vicinity of the facility. 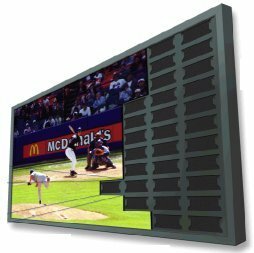 Advertising panels on scoreboards will increase business by advertising goods and services. Manage critical parking data and direct drivers to open areas quickly and safely! Make it easy for drivers to find a parking spot and be on their way with a LED electronic display. Combination of one line displays, two line displays up to multiple lines. Basic models use single color letters and we go up to full 16 million colors. We offer a variety of models that offer an easy way to display and easily read at the proper distance, the vital parking information drivers need to avoid confusion and unnecessary waiting lines. With the ability to reproduce WAV sound files synchronized to the visual data, Our displays are ideal for architects required to comply with the "American with Disabilities Act". Contact us to find out how we can help solve your communication needs! VideoScreens Development Division provides training and custom design services. Our staff provides consulting in all video areas: LED displays, projection video screens, video processor integration, strategy development, LED displays, selling, multiple screen performance and effective video screen design skills. To meet the unique needs of our clients, Scoreboards-US and SBJ focuses on its network of experiences in sports, corporate, academic, international, and public organizations. Consulting assignments can typically include both small end user needing only one screen and the high end users needing multiple video screens and processors. We listen to your needs, make evaluation assessment, then we design, a system that is right for you.